We've gone over Your Rituals, The Sacrament, Your Disciples, Creating Your Religion and The Mission already. This time we''ve invited Adriaan to talk more about the background story of why we're actually making this game. Hello aspiring gods, elders and cult creators! This time it’s me, Adriaan, talking and I'll tell you about the history and creation of Godhood, about our inspirations and the journey of creating the game so far! The monks here at Abbey Games always had a love for god games. We’ve played games like Populous, Majesty, Black & White and Doshin The Giant for more hours than we can count. So it makes sense that our debut title was Reus, a god game where you control 4 giants of nature. In the process, we found out that making god games is… very tough. There is no clear mode of interaction (like an FPS) or structure (like an RPG). What actually makes a god game a god game? Is it terraforming? Controlling nature? Having followers? When we decided we wanted to make a new god game for our third title, we were a bit puzzled that the biggest overlap between all those games where the colors blue and green! However, there are two aspects to playing as a god that we found very interesting and hardly explored: religion & indirectness. The idea that you tell your people what is right and wrong, and that they create a culture surrounding those commandments. That is what we aim for with Godhood: Create your own Religion. We want you to be able to create a greedy religion to fight for gold and have high inequality, or a merciful religion to convert people by forgiving them. Those kinds of things. Religion and culture are two sides of the same coin, in a way, and we wanted you to be able to shape that. The other part is the indirect control. We figured that if there really is a god, he/she/they obviously gave up on hurling stones at the enemy and smiting the unrighteous with thunder bolts at some point. However, a lot of believers nowadays believe in something that guides their morals, inspire them or give them strength. The gods present themselves through their followers. I personally find this both fascinating and in some cases even romantic. The idea of an ideal, not out of this ordinary world, which is worth pursuing and believing in. At the very least it shows the incredible power of human creativity to control and shape our reality to an idea we personally or as a group believe in. This idea we want to present in Godhood as well. You are a god, and you do control what is right and wrong. But the people need to believe in you. Only your followers can show or channel your power, wisdom and truth to the world. Atheists could very well be walking around in the world of Godhood, and it would be hard to blame them for being atheist. Because maybe your disciples are just playing tricks on them to "prove" a god exists. Your disciples, on the other hand, believe in you, and will organize themselves into a religion to do what is right in your eyes. Just a couple more months, before we aim to deliver this unique take on what it is like to be a god. It was and still is a very challenging journey, since we didn’t have much to copy from. 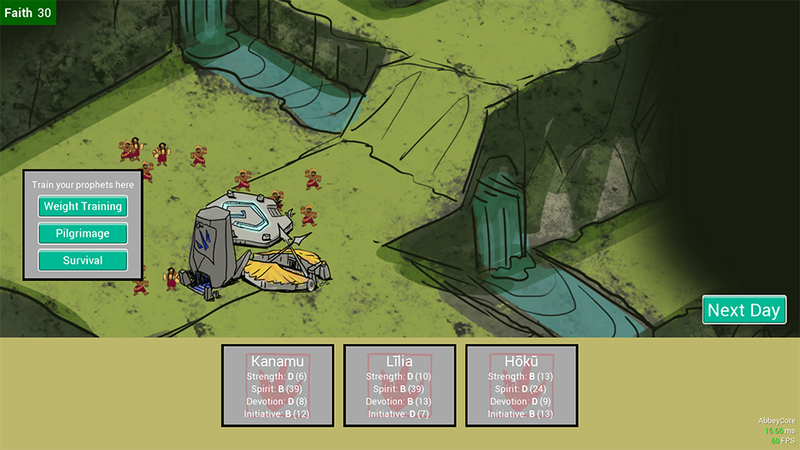 As the game is nearing its production phase the pieces are starting to really fall together. I’m very confident that we will bring you something truly unique from other games, and quite fun and replayable too! 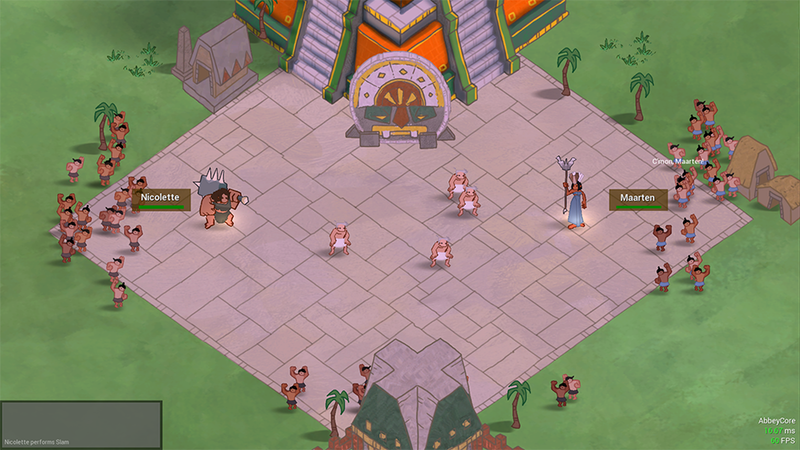 A playful and inquisitive game about religion, culture and believers! And with that, you've gotten a little peek in what went down behind the scenes over the last couple of years. Do you have any more questions for Adriaan or any of the developers about the making of the game? Let us know in the comments! This is the last Inside Godhood post for a while, but Godhood is going to Kickstarter January 30th! See this post to learn all about it. We'll update on the game during that campaign, of course and we'll resume this series of blogpost after it's done, so stay tuned! We'll take a little break from Inside Godhood to focus on the Kickstarter for now, but will be back soon!